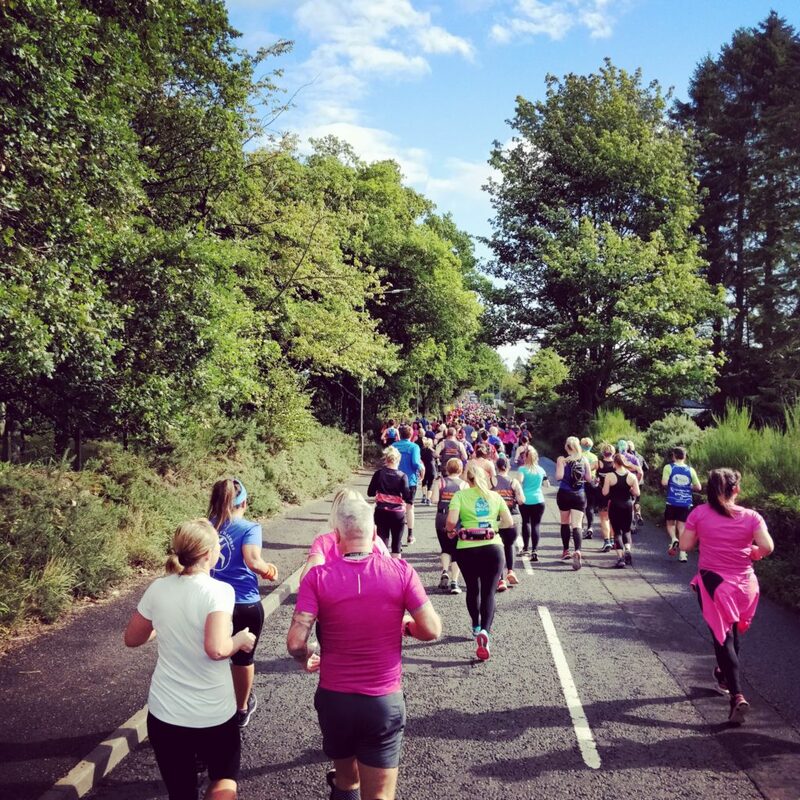 It’s Sunday, it’s half past 8 and the Gin Runners are on the way for the second instalment of the Auchterarder Running Festival 2018. 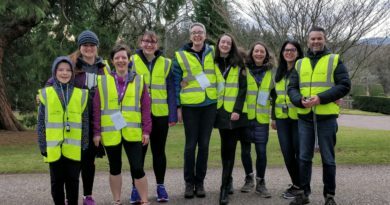 We’d had a brilliant time doing the 10K on the Saturday, so surely this would be twice as much fun. Well it’s twice the distance, so it stands to reason. Having sampled the delights of the equestrian shop (THE place to go if you need a gun case) the day before we hung about outside while the mass warm up thing happened. 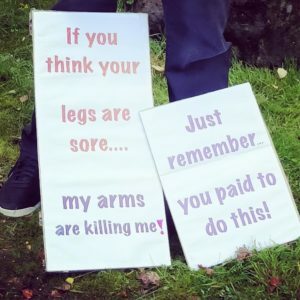 The Half Marathon sells out extremely quickly we were told. Organised, for once, we were sitting with laptops at ready as soon as it went live on EntryCentral to make sure we didn’t miss out. As the final countdown to the start approached we took our customary positions at the back of the crowd and waited for the off. The weather had once again been kind to everyone, not too warm but not raining. 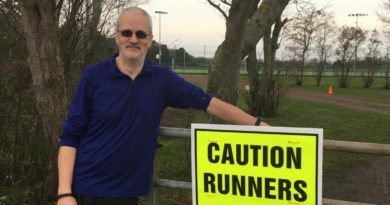 A Half Marathon is a big undertaking, and after the exertions of the 10K the day before we really didn’t know how this was going to go. We decided it was another “just get round” kind of day. The starting horn blasted and the fast folk down the front scurried off up the wee hill from the start. Back tour end of the field there was much “good luck” and “Enjoy it” exchanged before we passed under the start / finish arch knowing it’d be *cough* over 2 hours *cough* before we saw it again. 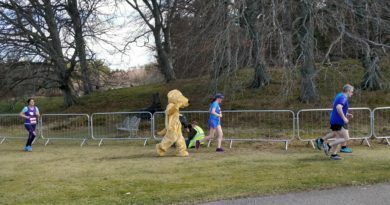 The first part of the course was the same as for the 10K, really pretty through the golf course. I did feel a bit sorry for the chap who decided that was the time to get in his car and head off. 650 runners takes a fair while to pass. As we were going to be reviewing the weekend, this was another chance to try out the photography-on-the-run. It’s amazing how many pictures of sky, road or half a green blur we got. We’d dispensed with our GinRunners attire for this one, instead wearing the 10K t-shirt from the day before. This was partly because it looked really cool..
As it turned out, it also meant we got SO much support. “You’re doing the double, good for you”. Going down tiddly down down. As we headed down the hill we’d met yesterday it was hard not to get carried away. The first 7k-ish of the course is a brilliant run. Scenic, well supported and entirely downhill. We kept the pace steady but knew we’d pay for all this “down” eventually so tried to enjoy it. Along the way we chatted to various folk and made the most of a wonderful (so far) experience. After a while we left the town behind and headed into the countryside. Every so often the route passed some amazing houses though. Fancy wood and glass affairs that made us wonder how they kept the windows clean. They probably have a man come round once a month. Clean the windows, wash the Range Rover and polish the gravel. 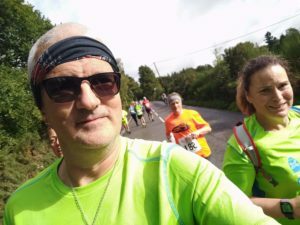 This was probably about the most enjoyable first 10K of a Half Marathon you could wish for. Even the people on the bus that was stuck as while we all ran past were smiling and waving. The marshals at every junction and narrow bit did a great job controlling the traffic and letting the runners do their thing. Going up tiddly up up. Things turned around, in more ways than one, at the half way point. Here we headed into Strathallan Estate for some running round in circles to make up the distance. Having done the first half of the race in about an hour we knew we’d never manage that pace on the way back. This is where we gave “jeffing” a go, running for 90 seconds then walking for 30. This definitely helped and surprisingly it didn’t have a massive effect on the pace. We Jeffed our way round the estate, being joined by a couple of new friends who liked the thought of organised walk breaks as much as we did. At this point we unleashed our secret weapon. There are loads of different sports nutrition products on the market, but we’d improvised. Yep, it was time to unveil the Aldi Coconut protein balls. Not sure if they actually made any difference (do any of these nutrition things ?) but it was certainly to a laugh. When did a stranger last offer you one of his balls ? Alas we got to a point where not even humorous double entendres were going to disguise the fact that this uphill bit didn’t seem to be ending. It’s always about 15k into a half that time seems to stand still and that was happening here. Good job the supporters were still out, it’s amazing how much a “you’ve got this, you can do it” helps. Special shout out to the girl with her car parked on the lay-by at about 13K. Even though the rain had started she was out cheering everyone on. Not sure proper runners double back to give spectators a hug but she deserved one. The GinRunners stuck together until abut the 19K marker. At this point Dizzy’s bloody cheerfulness was not exactly helping so he took off to have a serious go as the the last couple of K while Bex plodded on, chatting to her new found friends and counting down the steps. Approaching the finish line the announcer gave everyone a final push. 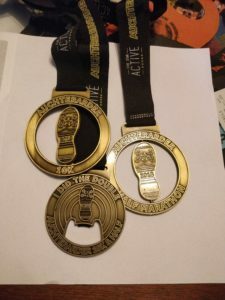 We really appreciated the special shout out to those who had done the double, the 10k and half marathon. Honestly, how that man had any voice left we have no idea, he did a BRILLIANT job from way before the race started until the last runner was home. Crossing the line and collecting the half marathon medal and that all important Double Dare medal was one of the most emotional things we’ve experienced running. All the doubts, all the blips in the preparation, all the bloody up hill, it was worth it. It was worth it for two t-shirts, 2 bottles of beer, three medals and a whole truckload 0f amazing memories. 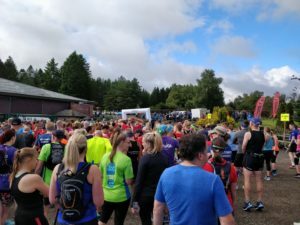 We’re not sure when the 2019 Auchterarder Running Festival goes on sale, but we’ll be sitting there on Entry Central again. Oh, did we mention it was down… then up. 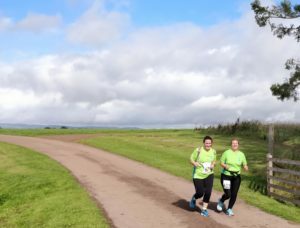 ← Auchterarder Running Festival 2018, 10K Review.